David Lehman and Gov. Ned Lamont in February. The Connecticut Senate voted overwhelmingly Wednesday to confirm the nomination of David Lehman as the commissioner of economic and community development, ending nearly a two-month debate over whether Lehman’s history as a Goldman Sachs partner during the financial collapse of 2008 should disqualify him from public service. The vote was 28-8, with three Democrats and five Republicans opposed. Senate President Pro Tem Martin M. Looney, D-New Haven, and Senate Minority Leader Len Fasano, R-North Haven, each told their colleagues that Gov. Ned Lamont should be allowed to name his own cabinet, barring clear evidence that a nominee is unfit. The administration and Lehman made a hard push for confirmation, with Lehman making himself available to every senator. Lamont invoked a halcyon time of corporate engagement in Hartford on Feb. 1 as he introduced Lehman as evidence of his administration’s ability to make common cause with business: Lehman, 41, was walking away from a lucrative career on Wall Street to volunteer as the unpaid commissioner of economic and community development. But Lehman’s history at Goldman Sachs and the investment bank’s role in the financial collapse quickly became a flashpoint. At issue is what Lehman knew about the poor quality of collateralized debt obligations, exotic and risky financial instruments known as CDOs, sold by Goldman Sachs to investors. Lehman joined the firm in 2004, when he was 27 or 28 and became co-leader of its Structured Products Group Trading Desk in 2006. Looney voted for Lehman in committee, but warned he was uncertain about his final vote. 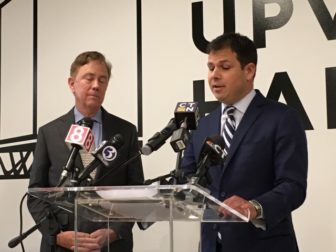 On Wednesday, Looney said there was a “strong presumption” in favor of deferring to the governor, saying on balance — and in this case “admittedly a close balance” — Lamont should get his pick. Sen. Marilyn Moore, D-Bridgeport, said she was convinced to support Lehman by business executives Lehman visited in Bridgeport at her invitation, saying he displayed a strong understating of development challenges in the state’s largest city. The only senator who spoke in opposition was Sen. Rob Sampson, R-Wolcott, who says his objection was based on a disagreement with Lamont’s approach to economic development, not Lehman’s history at Goldman Sachs. Sampson wants a clean break with the state offering economic-development incentives. “The problem I have with this is that it’s very much like corporate welfare,” Sampson said. Other Republicans voting no were Kevin Kelly of Stratford, John Kissel of Enfield, George Logan of Ansonia and Heather Somers of Groton. The Democrats in opposition were Mary Daugherty Abrams of Meriden, Mae Flexer of Killingly and Matt Lesser of Middletown. Confirmation of executive nominees require a vote only by one chamber, and the Lamont administration chose the Senate for Lehman’s review. But House Speaker Joe Aresimowicz, D-Berlin, House Majority Leader Matt Ritter, D-Hartford, and Rep. Caroline Simmons, D-Stamford, the co-chair of the Commerce Committee, said Wednesday they supported Lehman’s nomination. Lehman serves as commissioner of the Department of Economic and Community Development and senior economic advisor to Lamont. Two former corporate CEOs and chairs, Indra Nooyi of PepsiCo and Jim Smith of Webster Bank, are leading the non-profit Connecticut Economic Resource Center in a new public-private partnership with DECD.